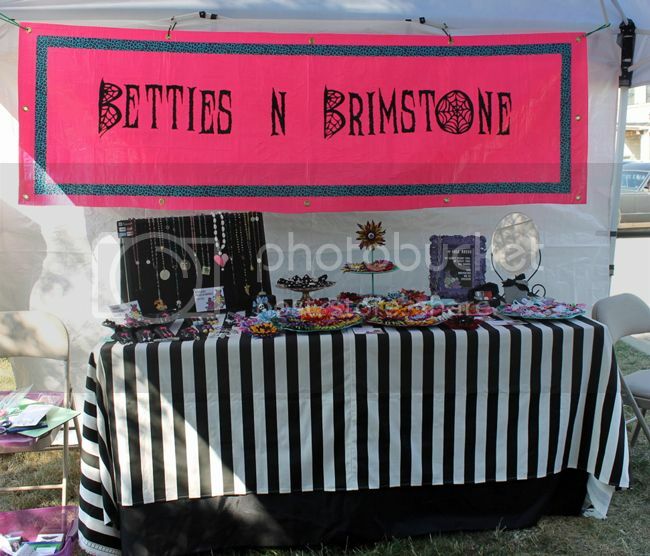 But we needed a Betties N Brimstone banner to advertise our goods inside the tent! (When I'm vending solo, I usually just pin a Hell Razor bunting-style banner on the front of my table.) We had a couple of weeks to get something together, and I knew I wanted a relatively inexpensive solution that was weatherproof, but also unique. Here's the completed banner, hanging in our tent last Saturday. Old, unwanted flat bedsheet (you'll be cutting this to size) or other large piece of fabric. 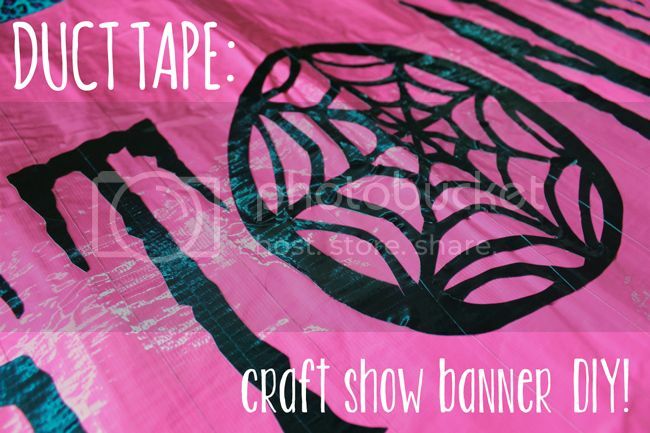 Background duct tape: For our banner, we used approximately 5 rolls of 15-yd hot pink duct tape for the front of the banner, and some less expensive gray tape for the back. Border duct tape: one 10-yd roll of blue/purple leopard print tape. Masking or painter's tape, to lay out lettering design. The first part of the banner-making process is not pictured here (I forgot. Sorry.) - but it's fairly simple. 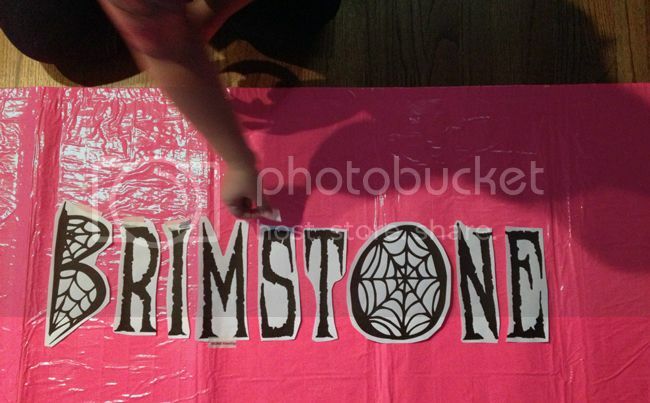 Cut your fabric to the desired size of your banner. We decided on a banner that is 8' long and 2 1/2' high. Use your background duct tape to carefully cover the front of your fabric, strip by strip. This is time-consuming, but worth it if you take your time to lay it down neatly. I extended the tape strips beyond the edge of the fabric just a little bit and wrapped them around to the back side. This gives the edges a nice finished look. The back doesn't have to be perfect - it's the back - no one will see it. Here I am laying out the lettering on my pink tape-covered background. I printed out the letters on a computer, full-page size, and trimmed them closely in order to get an accurate idea of how they would fit on the final banner. I used painter's tape to hold the printed out letters in place once I liked the spacing. Each letter will now be hand-cut and taped down individually. The simpler the font, the easier this step is to complete. In my case, the "Bs" and the "O" were a freaking nightmare. So many small cuts... sigh. Each letter was cut out by taping down 2-3 strips (depending on letter width) onto an x-acto cutting mat. I then taped the printout letter on top, and carefully traced the letter outline, cutting through both the paper and the tape with an x-acto knife. The tricky part is to carefully peel the cut out letter from the x-acto mat without stretching/tearing the tape letter. Sticking the letter down into place can be tricky, too, since you don't want the letter to flop around and stick to itself. So again, take your time. Having a helper is good, too. In my case, Todd came to the rescue. Thanks honey! You may find that using tape to make a baseline for adhering the letters is helpful. But maybe not. Do whatever works for you. Be patient. I discovered that the lettering still seemed small compared to the overall banner, so I added a leopard-print frame using patterned tape. This meant carefully measuring and marking with (painter's) tape all around to get the frame straight and evenly positioned from the edges all around. Woo hoo! A finished banner! Then Todd helped me by adding the grommets using a grommet kit, which is pretty simple to do. Generally, you punch a hole through your banner using a special die and hammer. The grommet comes in two pieces: a front and a back, which are hammered together using another special die (that holds it in place and helps bend the metal together) and a hammer. 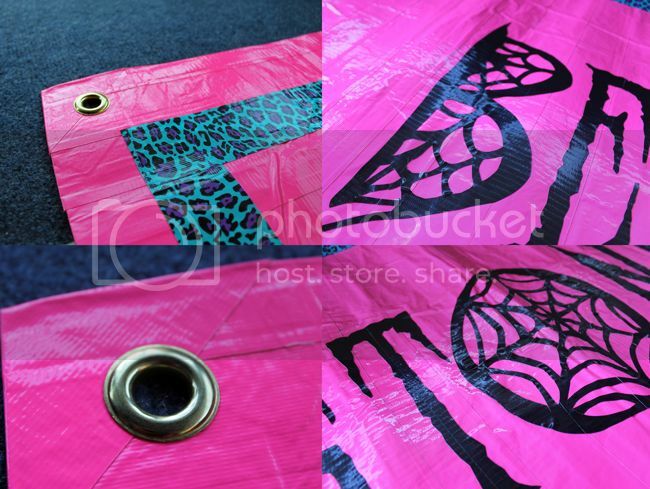 Here's a few detail shots of our finished banner. If you look closely, you can see that the "B" and "O" did get a little stretched out while cutting/peeling from the x-acto mat, but duct tape is pretty forgiving and you can sometimes stretch it back into place and make it work. Didn't it turn out cool? I think so. I'm also thinking I may add some smaller text below... something like "blog - handmade - vintage" so people know what we're all about!